TL;DR: ASO Analytics is open to everyone; replies to reviews from Telegram app; Semantic Analysis reports; auto-added keywords for Android apps, and more. 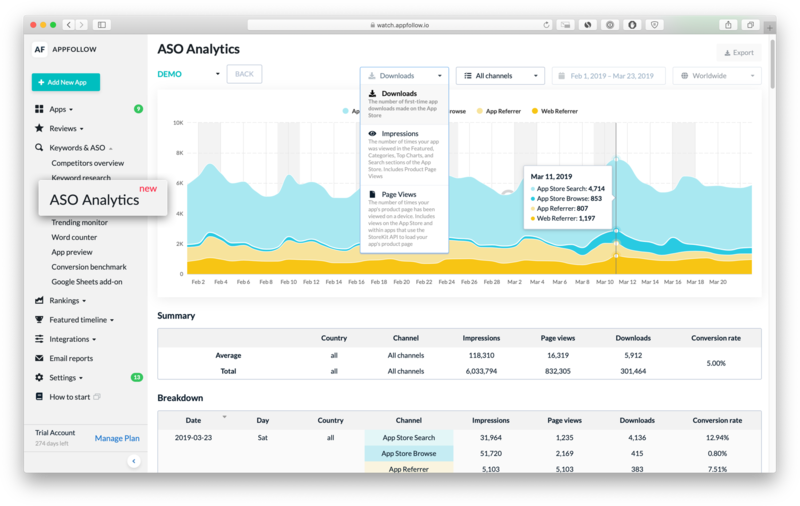 ASO Analytics tool is officially available to anyone! Analyze ASO performance for apps from App Store and Google Play on a single dashboard. Users no longer have to switch between consoles to compile different metrics in a single report. Export analytics to any service you like. You can use AppFollow API to export ASO Analytics data wherever it's convenient for you to work with it. Have ideas on how to improve this new section? Share them at help@appfollow.io so we can make analytics even easier in subsequent versions. You can talk to app users in Telegram. Use the Telegram Reply Bot to reply to user reviews in chat. It's fast and easy. Add the bot to the team chat to let the whole team reply to users. Learn how to set up the bot in our Help Center. Analyze reviews in commonly used services. The new Review Semantic reports will help you to do a quick deep-dive into user attitudes. 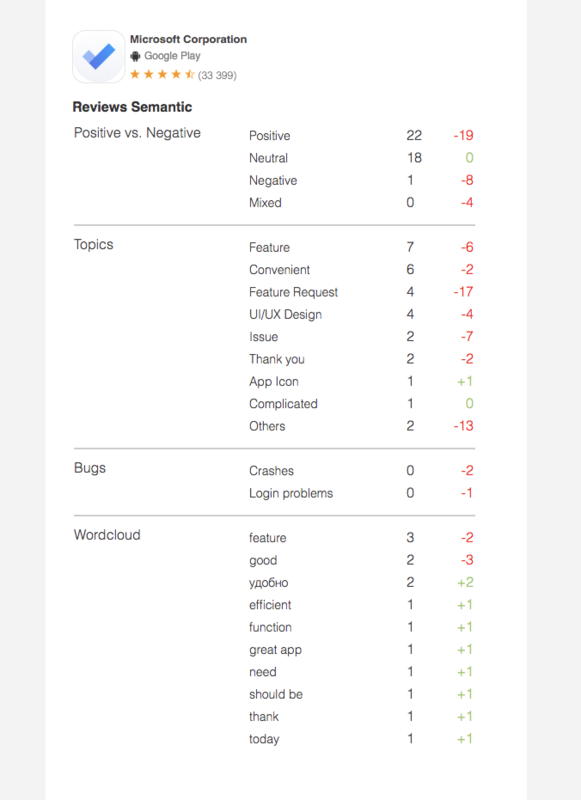 React quickly to bugs identified in reviews, see user attitudes based on the words they use to describe the app, or assess how the positive response has grown after you reply. Reports can be delivered by email every day, week, or month. The first column displays data for the current reporting period, while the second column shows the change from the previous one. While reports are currently in closed beta, we are adding services the reports can be sent to. Send us an email at help@appfollow.io to join the beta testing. Boost your work with keywords in Google Play. Find high-potential search requests and top app rankings in different countries. Now when you add an Android app to the app collection, you instantly get popular relevant keywords. We'll add keywords for 3 countries: the account country, the default collection country, or countries where the app ranks higher. On average, up to 50 keywords are added when adding an app. The number of keywords depends on how thoroughly the app title, subtitle, and description are filled out. 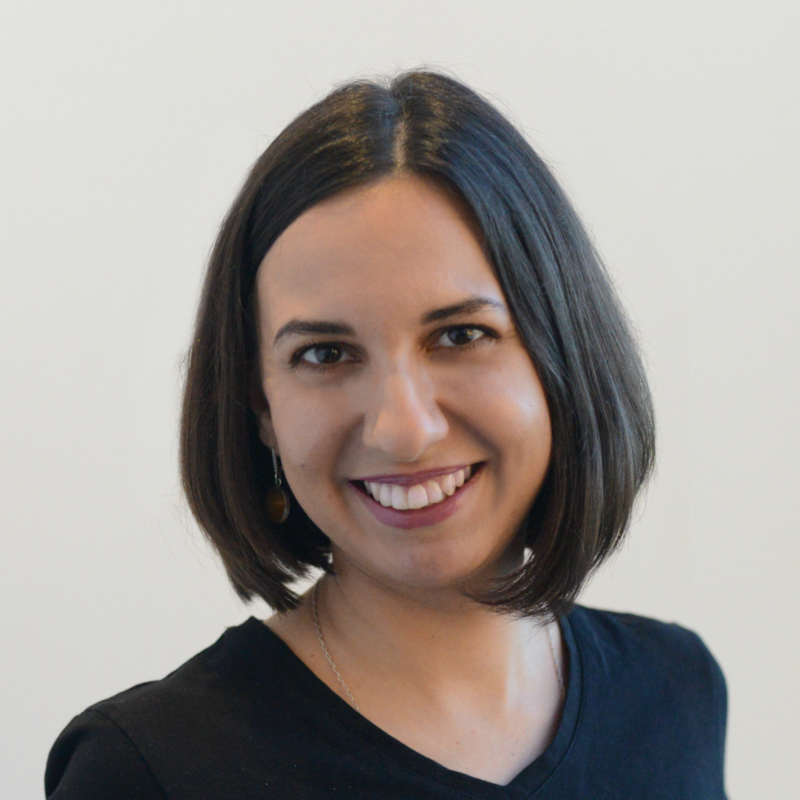 Work with only the keywords that make your app rank higher. Perform ASO for all the countries in Apple Search Ads. Last week, Apple began supporting new countries in Search Ads. AppFollow ASO Tools work with all 59 of them. That gives you more possibilities to localize, select keywords, and spot trends! Act now to maximize your ASO in new countries. Make it easier to integrate App Store Connect and Google Play Console. Once added, the integration will be automatically added to all your apps. That includes the ones already in your collections and the ones you add in the future. You don't have to worry about remembering the Account ID when adding a new app. Start working right away with reviews, ASO, and analytics immediately after adding an app. 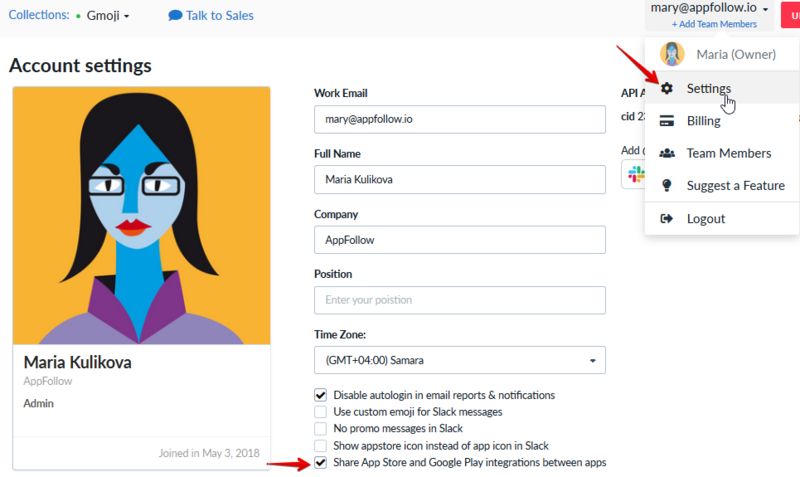 Be sure the "Share integration" check box is enabled: Account Settings > Share App Store Connect and Google Play Console integrations. Research the Google Play chart leaders by country and category. The updated Top Chart Ranking shows top chart Android apps together with iPhone and iPad apps. The Top Chart public page is available to everyone. This data can be exported through API to any service you like. We're developing a unique feature for working with reviews: You can upload any reviews to AppFollow to analyze user sentiment. You can analyze NPS and Google reviews or feedback from any service. Just download the CSV file containing reviews and start analyzing. Want to try it out? 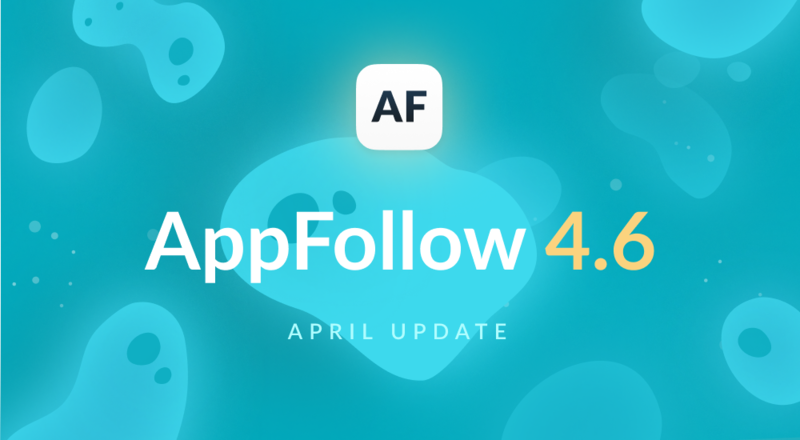 Send an email to help@appfollow.io. We're looking for beta testers right now.